Easy everyone, there’s no harassment going on here. In this column, we only ogle sandwiches. And "Texas Rachel in a Skirt," served at Rosebud American Kitchen & Bar in Somerville, MA, is worth staring at. 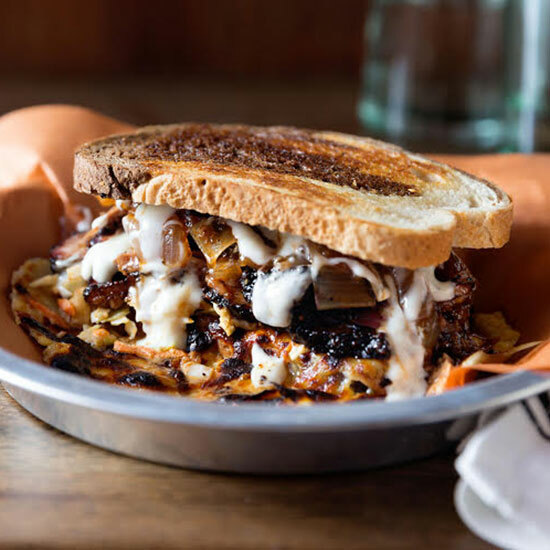 At Rosebud, chef John Delpha, who has a background in competition barbecue, makes his a Texas Rachel by swapping in barbecued brisket (and barbecue onions). And that skirt? The cheese melts and bubbles down over the edges, crisping up where it hits the griddle and forming a distinct, crunchy "skirt." It’s like what you’d find on the edges of your grilled cheese, only better. The bread: Classic rye is the only proper vehicle for a Reuben-inspired sandwich, no matter how unorthodox. The filling: A heaping mound of brisket and onions is clearly the main attraction. But coleslaw and horseradish “wonder” sauce do just enough to cut the deliciously fatty meat's richness, which the cheese skirt gives an appealing, toasty crunch that puts this sandwich in a league of its own.